I’ve seen many people, in various religions talk about choosing one word for the year. One word of what you want to bring into the new year, what you want God/dess to bring into your life. In the Magickal Sabbatical this winter, we were discussing all of our words, and I hadn’t thought about it until just then. What would I like to see most in my life, what one word could be all encompassing enough for me to want to use it in everything I do…. then it hit me, Create! What curiosity cannot be sated? What question wakes you from your sleep? What question could you devote a whole life to seeking an answer for, knowing as you do that there is no true end to the search? What magical incantation or question causes your inner door to swing open? 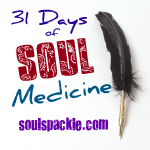 As part of our foundation work for these 31 Days of Soul Medicine, I ask you to ponder what is The Door for you? What leads you to this place on the trail, longing to go beyond? What soul making experiences make up the very bones of your life, and as such, the tapestry of your? There are so many different doorways and portals that have been created in my life. Mostly grief and abandonment issues, guilt and shame, illnesses from childhood. I feel like my entire life has been like a phoenix rising from the ashes… that which does not kill us makes us stronger. That old adage has more meaning to me than so many others! All of these things, that have made me stronger, that have made me into the woman that I am today, is what drives me to become more. To discover what it is that I’m going to become when I’m done “baking”. There is so much that I’d like to do, but I also know that Deity often has other ideas, and generally they are much better than I can imagine. So I know that one of my biggest doors/challenges is to trust, be open, and let go! What are your doors? What has brought you to the place where you are and where is the doorway going to take you? I stepped away for a moment and that moment turned into two years. I blinked and my children are both fully grown. It seems like only yesterday I turned 40 and now its almost my 41st birthday. Where does the time go? Wherever it went it left me with both answers and new questions. And now I have come full circle, deosil of course, as witches are want to do. So now I am going to change what I am doing here and why. I have started taking a class with Sage Goddess, the Magical Sabbatical, that is a journey of introspection and cleansing. It has barely begun and I’ve already learned so much. I am amazed at what I am finding and where I am going. Which inspired to me to start blogging once again. I am never far from my roots of writing, and here I can share so much of my soul. This is a new feature of my blog. I decided I liked the Tarot Tuesday and wanted to do the The Faeries’ Oracle by Brian Froud & Jessica Macbeth as well. It’s great to learn new things and this is such an amazing oracle that I could help but to start this feature. I’ll be doing it the same way I do the Tarot. Each week (and we both know it won’t be EVERY week) I’ll pull a new card and we’ll discuss it. If you have any questions, please feel free to comment here with them! Enjoy! Jamie Ridler holds Wishcasting Wednesdays with writing prompts that asks us to make a wish. To find what is in our souls, what we desire and then we write about them on our blogs. Then along with others that are doing the same thing, we all visit each others blogs and make the wish for each other. This is a powerful chain of wishes. If you’d like to join or visit more people who are also making their wishes, then please click on the button above. So here I go with another weekly posting of something Wiccan. It’s a great way to keep fresh information on my blog and it’s also a great way for me to learn new things as I go along. One of the things I like to do is find interesting Gods and Goddesses. So Thursdays will be God’s Day, and Saturday’s will be Goddess Day. Where each week (yea I know, probably not EVERY week) I”ll give you a new God to learn a little something about. I hope you’ll enjoy it and learn a little something with me. Tarot Tuesdays have become one of my favorite days to write on this blog. I know I haven’t been terribly consistent, but it’s been great for me. By looking at one card a week, I’m stretching my knowledge and my ability to read the Tarot. There wasn’t anyone who commented (specifically for the contest) last week, so there isn’t a winner. I guess if anyone wants a free tarot reading they can contact me about it and I’ll consider doing one for them. If not, well… se la vie! 1.a familiar friend or associate. 2.an animal, as a cat, that embodies a supernatural spirit and aids a witch in performing magic.